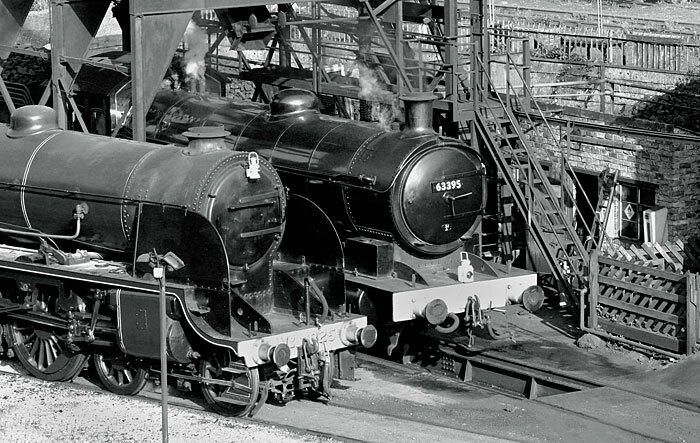 The London & North Eastern Railway built thirty-five of these locomotives between 1935 and 1938. 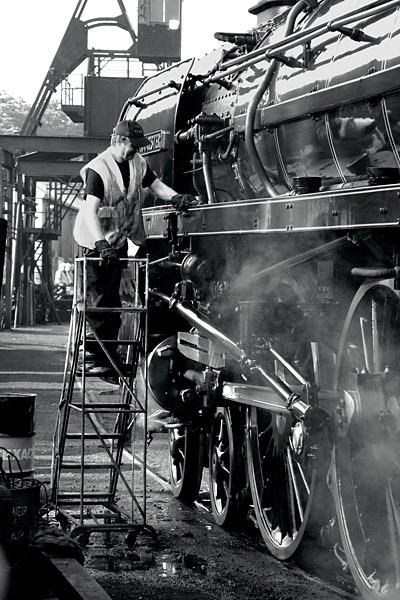 Following retirement by British Railways in 1966, the Sir Nigel Gresley Locomotive Preservation Trust has operated and maintained 60007, named after its designer. Built by the Southern Railway in 1927 to an earlier London and South Western Railway design, 825 is one of seven preserved. 63395 is the only one to survive from the 120 built between 1913 and 1921 by the North Eastern Railway to plans by Sir Vincent Raven. 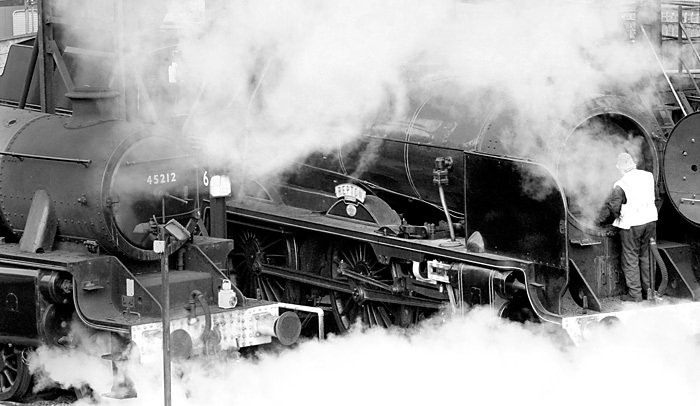 45212 is one of 18 to survive from 842 "Black Fives" built between 1934 and 1951 to designs by Sir William Stanier for the London, Midland & Scottish Railway. 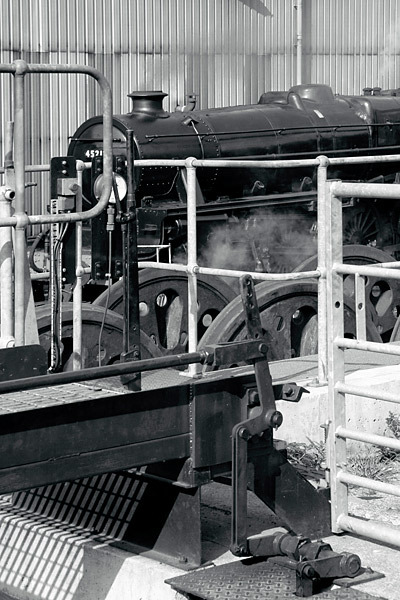 Repton hauled fast passenger trains on the Southern Railway from 1930 to1948 and on British Railways until 1963. 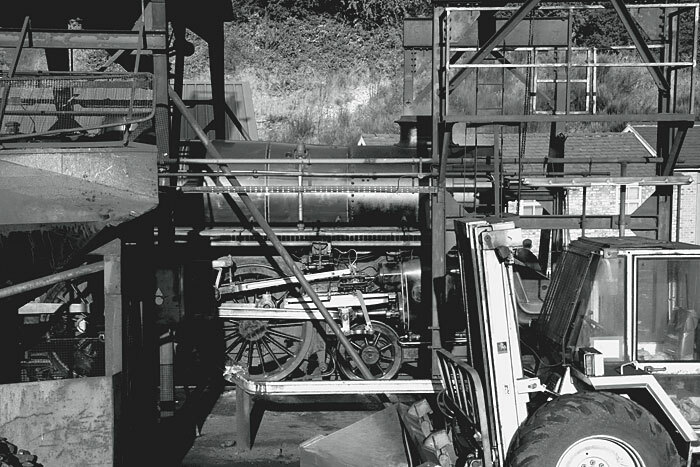 Richard Riddles oversaw the development of eight standard locomotive designs after the formation of British Railways in 1948. This Class 4 design dates from 1951. 75029 stands under the coaling tower in slanting early morning sunshine. Sir Nigel Gresley is making the first moves in a working day. 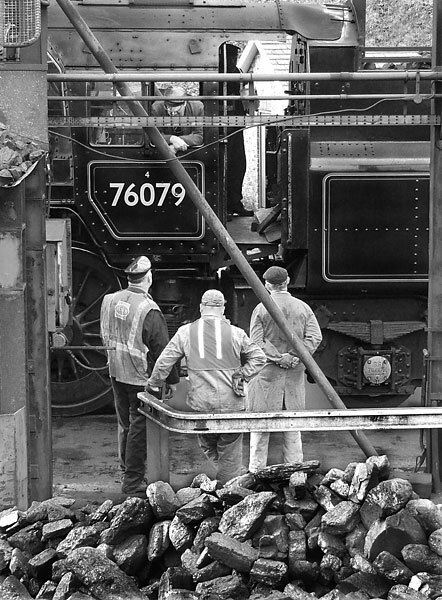 After coaling, watering and maintenance checks are completed, 60007 will back on to passenger coaches standing in Grosmont station. Footplate crew and helpers converse as this British Railways locomotive, built in 1957, awaits attention before moving on to its train. Built in the former Lancashire & Yorkshire Railway works at Horwich, 76079 was withdrawn from service in 1968. 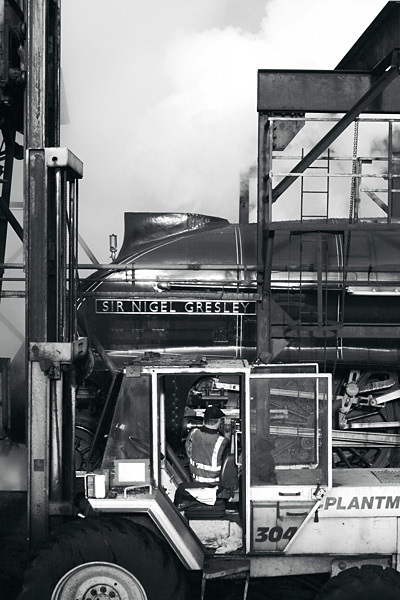 There are few vantage points around the locomotive yard so many images are variations on a theme. Here, I was interested in the contrast between the fine engineering finish of the locomotive straddled by the more robust and utilitarian steelwork of the coaling tower. 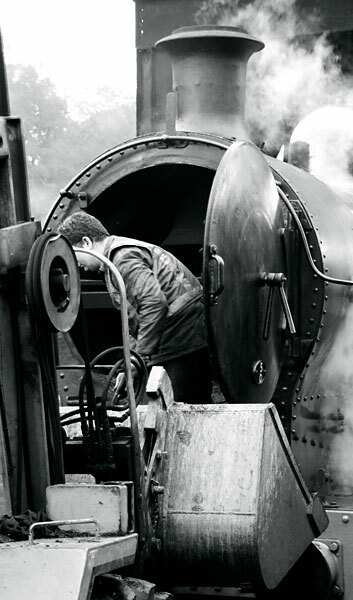 Clearing ash from the smoke box is part of the regular routine of preparing and maintaining a steam locomotive. 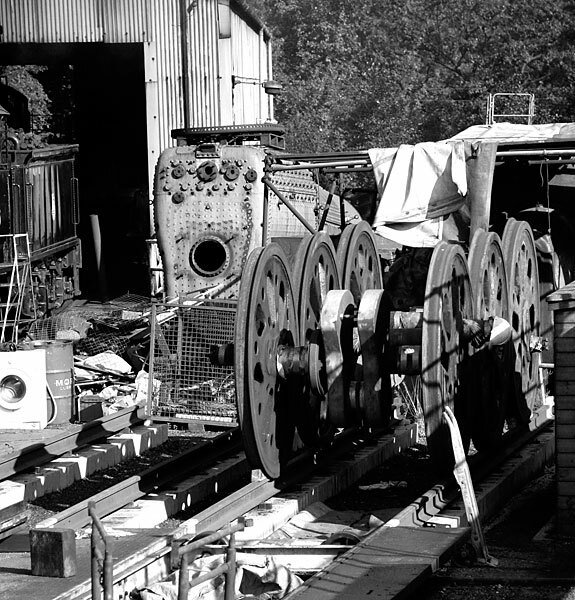 The equipment can be very basic as here, or perhaps slightly more mechanised as in the next two photographs. Binding one's trouser cuffs seems sensible. 49395 is the only survivor from a batch of London & North Western Railway freight locomotives built from 1921. It was withdrawn in 1964 and is now part of the National Collection at the National Railway Museum at York. 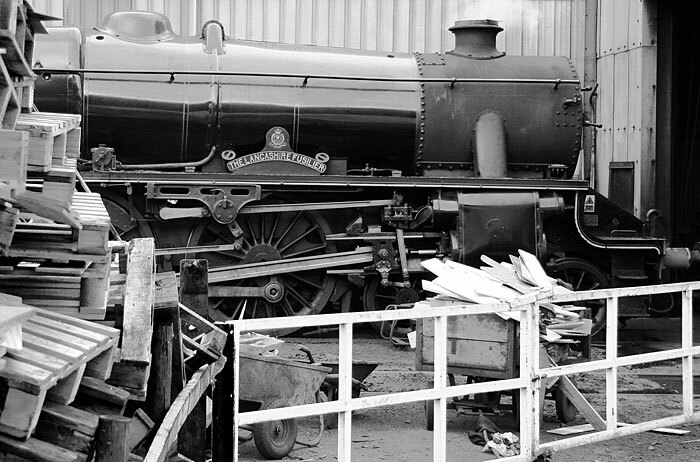 The Duke of Gloucester is a unique locomotive built by British Railways in 1953 and withdrawn in 1961. Its transformation from rusting dereliction to its present immaculate condition took thirteen years. 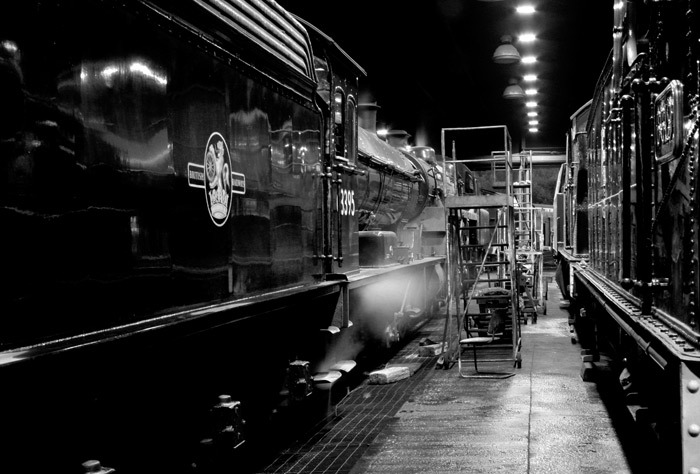 At the end of one day on a visit to the NYMR it is prepared for the night and the following morning. A visitor from the East Lancashire Railway, 45407 stands in evening light at the doors to the running shed. 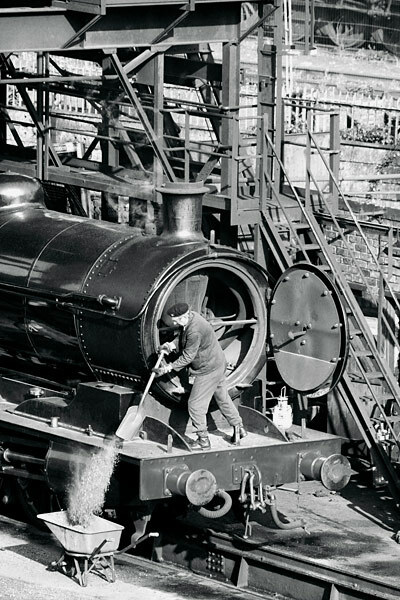 An LMS Black Five, the name was not carried in original service. The wooden pallets provide the kindling need to light the firebox coal to raise steam for a new working day. Somewhat grime encrusted, 30926 stands cold inside the running shed. 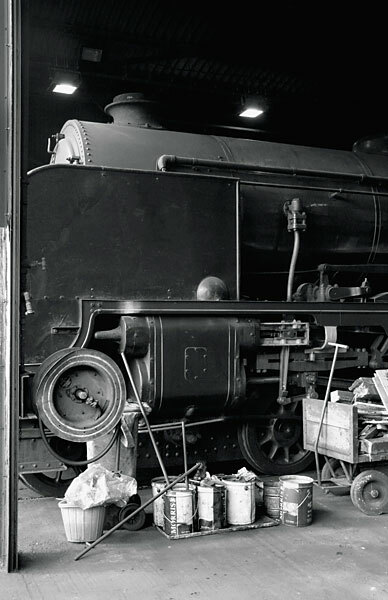 The foreground still-life is one of an ever changing collection of miscellaneous objects to be seen around the locomotives. 75029 and another still-life arrangement provide a new variation on a theme. The door frame to the running shed offers solid camera support for work in low lighting conditions and to me is preferable to a tripod. 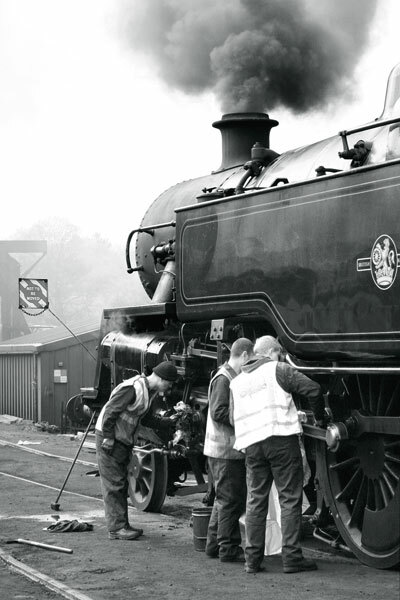 This locomotive frequently steams more miles annually than any other on the NYMR. 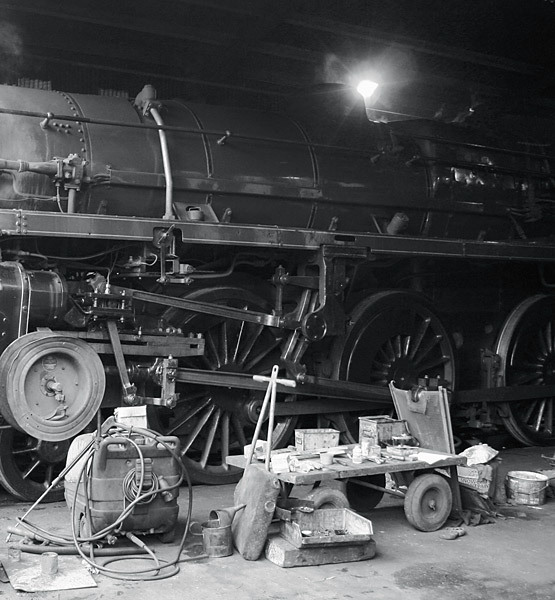 Slight steam showing signs of life, the locomotives gleam in the largely overhead lighting. For this photograph, the lack of a convenient solid support required a tripod. 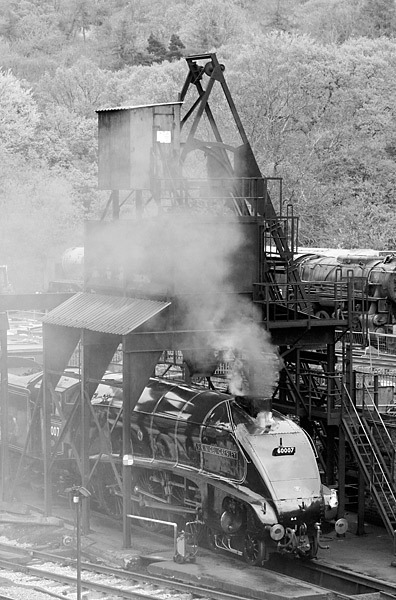 The engineering skills and equipment available on NYMR allow the completion of much of the engineering work required to rebuild and restore locomotives such as 34101 built by British Railways in 1950 to a 1945 Southern Railway design; its boiler and six foot driving wheels feature here. 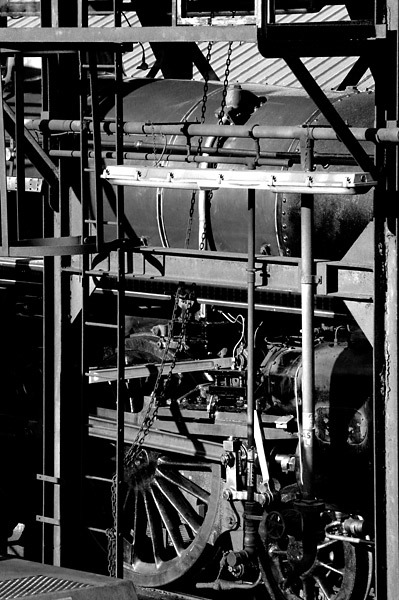 The metal structure in the foreground is part of an installation that allows a locomotive's large driving wheels to be dropped down out of their frames. Those from 34101 shown in the previous image are again visible. 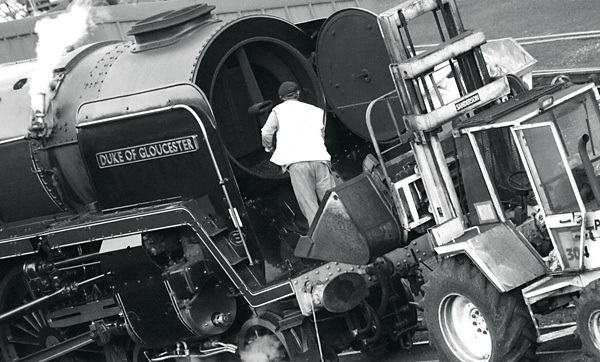 The Duke of Gloucester receives a final early morning polish before moving to the coaling tower beyond, and another working day. This pristine turnout can rarely have been matched in its short working life with British Railways. Three young volunteers clean and oil the running gear under the protection of a "Not to be moved" sign. 80135 was built by British Railways in 1956, retired in 1965 and withdrawn from NYMR service in 2008 for rebuilding.